COLUMBIA — Beginning early next year, Columbia residents who set their trash at curbside will actually be contributing to the city’s renewable energy portfolio. Columbia’s Biogas Energy Plant opened Tuesday. Glascock was one of several speakers during a dedication ceremony on Tuesday at the Columbia landfill, where the new alternative energy plant was built. He said the actual production of energy from landfill gas should begin mid-January. The Biogas Energy Plant will turn landfill gas into energy to provide power to Columbia. Landfill waste produces 50 percent methane, which is a potent greenhouse gas. City officials project that in its first year the plant will supply about 1.5 percent of Columbia’s energy use per year and provide enough power to supply nearly 1,500 homes. As the amount of waste produced in Columbia continues to grow, so does the landfill. So in 2006, Public Works officials decided they ought to find an economic use for all the methane the landfill creates. The City Council that year contracted with the Water and Light Department to build the biogas plant. One reason the Water and Light Department was interested is a voter-approved mandate to increase the amount of energy the city gets from renewable sources. Michael Carolan of Sexton Energy, the general contractor for the project, explained how the plant works to the 50 or so people who attended. Columbia, he noted, is the first city in Missouri to have a biogas energy plant. “This project shows progressions for the city of Columbia,” said Carolan. The project also got a boost from the approval of Senate Bill 54 in 2007, which allowed an expansion of the Columbia landfill plant. City officials hope to build a bioreactor at the landfill within the next five years. Bioreactors use water to rapidly break down organic waste. They accelerate decomposition, producing more methane and, hence, more renewable energy. The biogas plant could produce as much as 2.5 percent of Columbia’s electricity needs within the next five to 10 years, according to city projections. Regular listeners to the Archers (BBC Radio 4) who also have an interest in Anaerobic Digestion have been listening with interest to an AD story which has been running for most of the past week. There is nothing like publicity in a major national drama programme to raise national awareness of a subject, and this should be a very positive development for AD in the UK. In the story, Adam and Debbie are proposing to build an Anaerobic Digestion Plant on their farm. Fellow Ambridge farmers, Pat and Tony, are nevertheless, against it, and on the basis of the way in which bio-energy crops grown to feed AD Plants may end up raising food prices. Pat and Tony say you should grow food to eat, and not for fuel. I think they will find many supporters there. The sentiment has also been expresssed that of course the grain farmers will be in favour of fuel crops in the hope that it will keep the price of grain high. Government subsidies of up to 40% on initial AD Plant costs are being quoted, but aren't these tied to making a profit - not really a subsidy in the normal use of the word? There is a discussion forum for the Archers serial and an active thread on the subject to which I have contributed as SteveTechie. Visit the Archers Forum here and join in. Please also comment by posting on this Blog, or email me from the www.anaerobic-digestion.com 'Contact' page and give me your permission to include your text in a blog posting/Newsletter. The following newspaper article was published in the Shropshire Star on December 1, and provides encouragement to AD. It may have been a press release, but nevertheless the Shropshire Star gave this front page exposure, on a day when a biomass power plant elsewhere in the county was headlined and the plans for that plant were described as "controversial" within a generally negative article. Residents in Ludlow are converting about 600 tonnes of waste food into electricity and compost each year. The food is being saved from landfill thanks to a £2 million-plus biodigester. Today residents in Ludlow, Shropshire, UK, were thanked for their help in making the town's new food waste collection service a big success. And they were encouraged to continue using the scheme up to and over the Christmas period. The waste food collection scheme was launched in May, with food being collected from properties in the town and taken to the biodigester for conversion int electricity and compost. More than 5,000 properties in Ludlow town are covered by the scheme and new figures show that 75 per cent of these are currently putting their food waste out for collection - up from 66 per cent in June. On average, just over 3kg of food waste is being collected from each participating property every week. This means that some 550 to 600 tonnes of biodegradable food waste will be diverted from landfill each year. Today Mark Foxall, Policy and and Strategy Officer with Shropshire Waste Partner ship, said: "Up to and over Christmas we expect there to be a big increase in the amount of food waste that each household produces so we are asking people to continue to use the scheme over this important period - and ask those who don't currently use the service to consider doing so in the weeks ahead." The food waste collection scheme is run by South Shropshire District Council in partnership with Veolia. From the early introduction of Anaerobic Sewage Treatment, AST, technology to Latin America 20 years ago to now, the technology has become a viable alternative to provide affordable sanitation to the region. The engineering community has learned to identify and manage the main risks factors of the technology, namely: odor emissions, material corrosion, scum removal and low treatment performance as compared to aerobic biological processes (70 - 75% BOD and TSS removal). AST is used as an advanced primary treatment system, with low temperature anaerobic digestion and thickening in one compact, operationally simple and energy efficient unit. The technology can be considered mature in countries like Brazil where major cities such as Curitiba, Campinas and Belo Horizonte have built large plants, up to 80 mgd in capacity, based on the combination of UASB reactors and a polishing step. Diverse polishing steps have been researched, piloted and implemented successfully in the field. Examples of intermediate to large scale plants operating along with Stabilization Ponds (Bucaramanga, 16 mgd), Trickling Filters (Cazadores and Barao Geraldo, 7 mgd) to Activated Sludge (Pizarrao, 13 mgd), Dissolved Air Flotation (Onza, 80 mgd) and Biological Aerated Filters (Boa Vista, 5 mgd) are presented. Most of the existing experience is with warm sewage, with temperatures of 20C or above using upflow anaerobic sludge blanket, UASB, type reactors. The technology has also been applied to colder influent sewage with temperatures as low as 15C. in smaller scales of up to 1 MGD obtaining 70% BOD removal and using anaerobic baffled reactors. Additionally, new concepts and developments such as the HRAP are being implemented and tested at full-scale in mid-size municipalities of Colombia. The capital costs of implementation to achieve secondary level treatment are significantly lower than conventional technology. Savings of up to 50% in capital costs to achieve secondary level treatment using UASB + lagoons have been reported. Lower savings are realized for the combination of UASB and activated sludge. BlogMaster Comment: AD is clearly a compliment to aerobic systems which pays off for sewage treatment for the Latin Americans. We are sure that many of our subscribers are watching the Anaerobic Digestion scene just waiting for the confidence that the UK government really is going to give increased support to AD through the ROCs scheme, before making some big decisions. If, as seems likely, a doubling, of ROCs is soon announced, this will give the economic viability of Anaerobic Digestion a big push forward. We would like more of course, but at least this is going in the right direction. While we await a formal announcement of the ROCs changes, which we are all hoping will be favourable to Anaerobic Digestion by doubling the current ROCs subsidy payments in the near future, has everyone taken a look a the UK government report setting out their strategy? If you have not I suggest that it is worth reading the Biomass Strategy Report here, which "sets out our broader policy on improving the recovery of energy from waste". Also Richard Parker and Renewables East have published a document on the DEFRA web site which is well worth looking at as it lists other UK government renewables incentives and how they may be applied to Anaerobic Digestion. I have copied part of it below, but for the full document including a chart showing the projected payment value for AD (£/MWh) energy including ROCs at double, and further information on other financial assistance available for bio-energy plants such as enhanced capital allowances you need to click here. Since 2001, the Government has provided an incentive for business investment in energy-saving and environmentally beneficial technologies through enhanced capital allowances (ECAs). give a 100 per cent first-year capital allowance for the purchase of qualifying plant and machinery. The Government is also presently engaged with the European Commission over a State aid application to extend the ECA scheme to the most carbon-efficient biofuels plant. The Government’s intention is to extend payable credits to investments of this type, although this will be subject to the same state aid application procedure. As with the SME R&D tax credit, the arrangements for payable ECAs would allow companies to surrender the element of their trading losses attributable to ECAs in return for a cash payment from Government. The unrelieved trading loss would then be reduced by the amount surrendered. A former chairman of the Composting Association, Trelawney Dampney, has warned councils against "charging off" down the anaerobic digestion route before checking if the technology is "commercially sensible". Mr Trelawney Dampney, managing director of Eco Composting Ltd in Poole, said analysis carried out by his firm had found that the technology - which processes organic waste to produce electricity and a soil fertilizer - was not economically viable. He said: "Everyone is charging off down this route without looking at basic economics of it- we need to have a reality check to make sure it is commercially sensible." The technology has gained in popularity following the publication of the English waste strategy which promoted AD to treat source segregated bio-waste. And it has also attracted attention because under renewable energy rules, from 2009 operators can have double the standard amount of renewable obligation certificates - known as ROCs - allocated to the process which accordingly gives a larger financial benefit. However, Mr Dampney claimed that even with these concessions, his company's analysis found against AD technology. He explained: "From an economic perspective, you would need treble or even quadruple ROCs to make the technology economically viable. Councils need to consider whether the income from the power generated, outweighs any extra capital costs you need to put into the plant? Our analysis show in the short term it is not cheaper than in-vessel composting." Mr Dampney pointed to examples in Europe which appeared to show in-vessel composting was a better financial option. He explained: "On the continent small anaerobic digestion plants get 3 or 4 times ROCs which makes it economically viable. The UK is only offering double ROCs. "You are looking at having a £2 million pound AD site for a 20,000 tonne capacity site whereas an IVC is likely to be around £1 million." Your Blog Master is a great fan of Trelawney Dampney and he can hardly be wrong can he? Please give your Blog Master, Steve your views on this. If commenting on the blog site is not to your liking or convenience please email me at info[at]anaerobic-digestion.com (replace [at] with "@"), and please give me permission to post your comments to this blog. We would all be delighted to hear your views, and especially views from any AD Plant owners, on this point. Anaerobic Digestion technology expert HiRAD(TM) is soon to complete installation of its AD pilot plant in Landhi Cattle Colony near Karachi Pakistan. Landhi Cattle Colony provides a unique opportunity for sustainable biogas production. It is home to over 400,000 Buffalo. This is the largest herd of these fine animals in the world. It also presents both a waste problem and a great opportunity for HiRAD's Anaerobic Digestion system to solve it. Currently over 8,000 tons per day of dung is produced, some of which is dumped on the land and some of which reaches the sea after some time lying in ditches, causing terrible pollution, risk of bacterial infection to inhabitants and bathers, and seriously damaging the marine eco-system. Following on from the pilot, a full size plant is planned which HiRAD expects to be the largest manure biogas plant in the World. HiRAD will use this dung to produce over 118 million cubic metres (4.1 billion cubic feet) of biogas and 128,000 tons of organic fertiliser each year, providing employment for over 400 local workers. The HiRAD plant will support electricity-generating capacity of over 40Mwe, but could alternatively provide over 170,000 Kg of LNG, enough to keep over 1000 buses running around Karachi. (Bus manufacturers worldwide take note!). Projects of this magnitude require long term plannning and development, and this project is the culmination of almost 10 years work by New Zealand Consultancy Empower, and NEC of Karachi and HiRAD of UK. "It is our privilege to participate in this trailblazing and life-changing enterprise, that will prevent over 1 million tons of CO2e reaching the atmosphere during its operational life, making this one of the largest ever CDM (Clean Development Mechanism) projects. The electricity produced will also help stimulate the local economy, and provide valuable additional revenue for the operator." The project will also include a 20 bed maternity unit, a laboratory to enable improved milk yields and health for the Buffaloes and other facilities to improve the life of the people of Landhi. The British nation is appallingly wasteful of their food. The UK government has launched a plea for a return to the thrifty approach of previous generations by buying less and eating leftover food. Each year, the UK dumps 6.7 million tonnes, of food. Furthermore, most of the waste - which nationally costs £8bn to treat or dispose of – is sent to landfill where it rots, potentially emitting the potent climate-change gas methane. The public must realise that while they are scraping food into the bin they are directly fuelling climate change. Waste food now presents a bigger environmental problem than packaging. The Waste & Resources Action Programme (WRAP), a government-funded agency that has been investigating food waste, complained that consumers were, in effect, dumping one in three bags of shopping straight in the bin. In an attempt to change attitudes, Wrap has devised a campaign "Love Food Hate Waste", launched at Borough Market in London yesterday by Ms Ruddock and the TV chefs Ainsley Harriott and Paul Merrett. Wrap's estimate of waste was compiled after polling almost 3,000 households and getting 300 people to keep diaries of what food they threw away. Most waste arose because people had "over-shopped" for a variety of reasons. This is a Summarised version of a much larger article at The Anaerobic Digestion Community Web Site (Food Waste). At Anaerobic-Digestion.Com we like to bring you information on all types of AD Plants, and we are pleased to be able to report that sewage works sludge AD Plant technology is advancing rapidly. The technology is now being developed significantly in many WWTW sludge treatment projects, as the abridged Water & Waste Treatment October Edition article here on our web site describes. Anglian Water has a new biosolids and energy plant at a Milton Keynes WWTW which treats sludge from the plant and provides energy, as well as sludge treatment, which we understand has set new standards for anaerobic digestion technology, and uses thermal hydrolysis as the pre-treatment stage. Cambi technology is the technology being used at the £16M sludge treatment centre. See more at the W&WT web site here. Friends of the Earth have published a report looking at what materials are likely to be left in residual household waste after extensive recycling has taken place. This attempts to predict how waste will change as the UK adopts much improved recycling practices, as required by EU Regulations. The report identified 14 significant residual wastes/material types from a 'hypothetical' capture rate scenario and 26 from a 'practical' capture rate scenario. Environmental groups are calling upon the UK government to stand by its recent commitments on renewable energy and to support a framework that will not undermine Europe's progress on clean energy. In a meeting organised by the President of the European Commission Jose Barroso last week (Friday 12th October 2007), senior level civil servants and European Commission staff were to discuss whether to weaken a European proposals to fight climate change. In March of this year, Tony Blair signed up to a European target to source 20% of energy from renewable sources by 2020. In August, a leaked memo revealed that the UK government, despite its rhetoric on climate change, was lobbying to water down the targets. The concern is that their lobbying has been all too successful and that at the meeting agreements will be made to weaken the 20% target, particularly by moving towards a system of "mandatory trading" of renewable energy certificates between countries. Imposing this policy on all of Europe would bring an end to alternative approaches which have proved highly successful in countries such as Spain and Germany in bringing forward large scale renewables. Friends of the Earth EWNI and WWF-UK have produced a rebuttal to the UK position. Friends of the Earth and WWF-UK believe that the binding renewable energy target agreed by all Member States, including the UK, in March sets an ambitious but realistic benchmark against which the adequacy of domestic policies must now be measured. The two organisations are calling on the UK government to bring forward new and truly effective policies which will ensure delivery of the UK's fair share of the 20% target, rather than seeking to weaken the target. More at FoE's web site here. PLEASE COMMENT ON OUR BLOG OR EMAIL ME FROM OUR CONTACT PAGE. WE EXPECT THAT MANY WILL HAVE STRONG VIEWS ABOUT THIS! Do You Agree With Cardiff University's Assessment of the Potential AD Renewables Contribution? Cardiff Univerity's Waste Research spin-off has a page which is vying with Anaerobic-Digestion.com for its place in the first page of the Google SERPS results. Sometimes our site is just above them and on other days it is a listing or two below. The page to which Google sends us to at Wasteresearch contains in my view really quite a negative and disencouraging analysis of the potential of Anaerobic Digestion to become a significant player in the renewable energy scene. An analysis can be conducted for anaerobic digestion in a similar manner to the previously used technique to estimate the potential of generating electricity by using all the UK's available waste. There is about 90Mt of waste produced in the UK each year. 62% of this waste stream is said to be biodegradable (DETR, Limiting Landfill, 1999). This biodegradable waste will produce about 150m3/tonne of biogas at 60% methane concentration (Warmer Information Sheet, 1998). Using a 70% process efficiency, 70% load factor, and the known 37GJ/tonne energy content for methane, an estimate can be produced. After accounting for the 20-40% of energy needed to maintain the digestion is accounted for, anaerobic digestion could provide the UK with about 1.4GW. This represents about 1.9% of the UK's installed capacity. It is really good to see people carrying out a reality check on Anaerobic Digestion, but I wonder if this data does not underestimate the amount of waste produced in the UK currently if all industrial and commercial waste is included? I also suspect that the compounding of percentages is excessively reducing power output. There is no mention of combined heat and power (CHP) use, which when included in projects, ups the efficiency greatly. There is also no comment here on the benefits of AD in providing local power close where it is consumed, meaning vastly reduced distribution losses in the power grid, or potentially from the products of AD when markets are found. So, if as I suspect we have some regular readers of this blog who are knowledgeable about such things, here is your challenge to email us at info@anaerobic-digestion.com with your comments in a form in which we can publish them, or use the blog commenting system, and stand up for AD! Clean energy investment accounts for ten per cent of all European venture capital investments, according to new research released by the Carbon Trust. The report shows that investment in clean energy reached a total of just under €2 billion in 2003-2006 - putting clean energy on a par with European IT, biotech and semiconductor venture capital investment levels. UK clean energy companies are proving the most attractive investment to date, accounting for more than 40 per cent of all European clean energy deals. The Carbon Trust report also shows that, if growth continues at the current rate, investment in clean energy could reach around €3.5 billion in 2007-2010 - an increase of 75 per cent. Clean energy companies are those operating within the energy system or supply chain with the potential to reduce CO2 - or other greenhouse gas emissions. Analysis of the technology types that are attracting investment in Europe highlights an interesting trend - significantly more capital was raised in Europe for energy consumption and efficiency technologies, than in North America. This indicates an emerging energy efficiency specialisation for Europe that could further develop in the next few years. Geographical trends are also appearing. Fifteen per cent of deals involved companies based in Scandinavia - with France and Germany also performing well, with seven and fourteen per cent, respectively. Regional clusters of clean energy companies have also appeared, with examples including London, Oxford, Munich, Paris and Berlin. Although renewable energy generation technologies are as popular as technologies aimed at energy conservation and energy efficiency in commercial buildings and industrial settings, significantly more capital was raised for consumption and efficiency technologies in Europe than in North America - could this be an emerging specialisation for Europe? There are still very few funds specialising in the clean energy sector - and, with the exception of the Carbon Trust, CDC Ixis and Emerald Venture Partners, few clean energy funds have demonstrated a consistent track record in the sector. To download the Investment trends in European clean energy 2003-2006 report - Click Here. June 21 -- The amount of money invested in renewable energy projects worldwide is growing quickly, fueled by worries about climate change, high oil prices, and energy security, according to a recently released United Nations report. The report says investment capital flowing into renewable energy climbed from $80 billion in 2005 to $100 billion in 2006. And while the renewable energy sector´s growth is volatile, it "is showing no sign of abating." While renewable sources today produce about 2 percent of the world´s energy, they now account for about 18 percent of the world investment in power generation, with wind at the forefront. Solar and bio-fuel technologies grew even more quickly than wind, but from a smaller base, according to the trend analysis from the U.N. Environment Program. And renewable energy projects are no longer limited to developed countries, with projects taking place in countries like China with rapidly growing energy demands. Looking at a trajectory of growth, the U.N. report concludes that by 2030, renewable energy could account for between 9 percent and 23 percent of installed energy capacity. Come on our subscribers - take your fair share of the market! There is stark and disappointingly vast contrast between the government's stated desire to create a low carbon economy for the UK and its financial commitment finding the solutions. For all the concern and apocalyptic talk setting out the need "to make real progress now" by Alastair Darling in last month's 'Meeting the Energy Challenge', White Paper, it seems government still expects the private sector lead the nation's war against climate change. 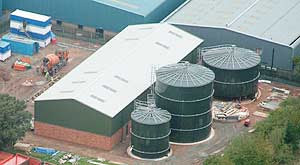 One example close to our hearts at Anaerobic-Digestion.com is research into low carbon energy technology. This is essential in Anaerobic Digestion technology and is the next task to be tackled if we are going to comply with the recent Stern Review's demand for action to support innovation and develop low carbon technologies. If the UK is serious about its stated aim of leading the field in low carbon technology then it must get sensibl realistic about the amount of public money it spends on finding the solution. Meanwhile, government continues to push forward measures to assist nuclear power as part of this solution but even here states that "it would be for the private sector to fund, develop, and build new nuclear power stations in the UK, including meeting the full costs of decommissioning and take their full share of waste management costs". Tackling the nation's growing energy supply and carbon reduction challenges is vitally important to our economy, and the environment. Our government must come clean on its real intentions. Is it really going to start investing serious public cash in finding the right solutions, or are all the fine words all that they are going to give us? Council chiefs in Wiltshire are providing around 2,000 homes with food waste digesters in a bid to cut household waste by 30%. Wiltshire County Council has signed a one-year contract with food waste digestion company Green Cone to supply two types of technology to residents - both of which can be used in gardens. Wiltshire residents are trialling Green Cone food digestersBoth digesters can deal with raw waste and cooked waste included cooked fruit and vegetable waste, bones and meat, including poultry and fish. The first called the Green Cone does not produce any compost but through anaerobic digestion converts the waste into water, carbon dioxide and a small amount of residue. The second type of food waste digester is called the Green Johanna. This is larger than the Green Cone but produces compost. Wiltshire food waste is presently sent to landfill and council estimates that digesters can reduce the average household's waste by up to 180 kilos a year or 30%. Toby Sturgis, the council's cabinet member for planning and waste, said: "People in Wiltshire are keen to be green, that is why we already recycle nearly 40 per cent of our household waste - but we know people want to do more. "I was appalled to find out that surveys show the average Wiltshire household throws £400-worth of food away a year. It's not sustainable to keep on burying this rubbish in the ground. It is expensive and it produces green house gases. "This initiative tackles the last major element of the household bin for which there is no green alternative. With the rise in fines for dealing with biodegradable waste we can't afford not to take action." Oxford which saw a reduction of 120 kilos. The Green Cone normally costs £79.95 including delivery and Wiltshire residents taking part in the trial can pick one up for £15. The Green Johanna is usually £108.94 including delivery and this can be picked up by householders for £20. Classifying a host of waste products as raw materials could break down the administrative barriers that currently make them difficult to reuse. Cutting red tape will make it easier to turn millions of tonnes of industrial and commercial waste into usable materials, according to the Environment Agency and Government-funded recycling champion WRAP (the Waste & Resources Action Programme). The initiative, the Waste Protocols Project, follows in the footsteps of a successful trial in this area which redefined composted waste that met certain standards as a Non-waste product. Steel slag from steel manufacture, which can be reused in construction and building materials and as an agricultural fertiliser. Gypsum from waste plasterboard which can be used to make new plasterboard and in cement products. Incinerator bottom ash which is made up from glass, porcelain, brick, gravel, sand, slag and ash from household waste that is burnt in incinerators, and can be used as aggregate in construction materials. Paper mill ash which is produced when sludge from paper making is burnt for energy recovery and the ash can be used as an aggregate. Uncontaminated top soil from greenfields and development sites can be reused on a wide range of horticultural and leisure sites such as parks, golf courses and football pitches. In addition the protocol will also look at the status of the by-products of anaerobic digestion, the technique of disposing of food waste favoured in the recently published Waste Strategy. The project will set standards that the by-products must meet and, should they do so, will do away with the need for costly licensing to dispose of or transport waste. The Environment Agency has confirmed its intention to develop a quality protocol for residues from the treatment of waste through anaerobic digestion. The announcement yesterday also said five further materials - steel slag, incinerator bottom ash, uncontaminated topsoil, gypsum and paper mill ash – would have protocols developed. The Agency wants to cut red tape for anaerobic digestion plants Once finalised, the protocols could mean the materials gain the status of "products", rather than being treated as "wastes", which means they are subject to the restrictive legal controls for managing, storing, transporting and using waste as a resource. The move to produce a protocol for anaerobic digestion – the treatment of organic wastes by bacteria in controlled conditions – fits in with the government's new waste strategy, which seeks to encourage use of the technology (see letsrecycle.com story). The Agency believes the new protocols – being developed under the second year of its Waste Protocols project – could save around £150 million a year by helping to increase the amount of material diverted from landfill. The Welsh Assembly Government is offering funding support for the development of new anaerobic digestion plants in Wales. The Materials Action Programme is willing to provide 30% of capital costs for any digestion facility set up to process commercial and industrial waste in Wales before March 31, 2009. The Materials Action Programme has allowed Bank Farm in Powys to convert its existing anaerobic digester to generate electricity from industrial organic waste Anaerobic digestion involves the treatment of organic wastes by bacteria in controlled conditions with limited access to oxygen. The process generates a bio-gas, a form of methane, which can be used to generate electricity. The capital support programme can support either a fixed plant or a mobile facility, land and infrastructure. The project can involve a new or expanded facility, and must use proven technology in commercial operation elsewhere. The input material for the plant must be source-separated biodegradable waste, with at least 60% from commercial or industrial sources. The project must be dependent on the programme's funding, but be commercially viable in the medium-to-long term. Full details of how to apply for funding is available on the funding section of the WRAP website. Bank FarmOne of the first digestion projects to benefit from the Materials Action Programme has been Bank Farm in Powys, which has now secured a £60,000 grant to convert its existing small anaerobic digestion facility to generate electricity from industrial organic waste. Urban-based local authorities should consider anaerobic digestion (AD) as an alternative to in-vessel composting for the recycling of municipal biodegradable food waste, according to researchers at WRAP. Speaking today (23 April 2007) at the annual Recycling and Waste Forum in Birmingham on Thursday, WRAP's organics supply programme manager Louise Hollingworth said: "In-vessel composting is obviously very established in the UK but there are only a couple of AD plants in the UK taking biodegradable municipal waste. Ms Hollingworth was discussing a report commissioned by WRAP and published this March, entitled "Dealing with food waste in the UK". The year-long study by Dominic Hogg of the consultancy Eunomia focused on the European picture for Anaerobic Digestion - a biological treatment conducted in the absence of air, which produces both a compost product and bio-gas that can generate renewable energy. The study discussed the 124 operational AD plants throughout Europe and the "clear benefits" of the technology. Ms Hollingworth also said that in the UK many local authorities are "concerned about the robustness of AD" and consider it an "unproven technology" however she said: "The European experience flies in the face of this." Anaerbic digestion "has a stronger, overall environmental performance" than other technologies, she added. AD could be seen to be an appropriate technology for urban local authorities as households in urban areas tend to collect a lower proportion of green waste. Pierre Hirtzberger, Project leader Biogasmax has contacted me to publicise the Biogasmax web site. He describes it as being for, decision-makers, actors in the alternative energy area. The european project Biogasmax has created a network of different european cities to share experiences concerning production and use of biomethane as fuel. The Internet site is on line. It will be filled up in the months to come by results coming from the members. The members seem to be six cities, which are looking at biogas use, sources and to improved technology. At least one city is using improved biogas from Anaerobic Digestion from sewage works anaerobic digestors. See the web site it at http://www.biogasmax.eu. A third of food is thrown away.. Don't Worry Anaerobically Digest it! British households are throwing away around a third of all the food they buy, amounting to 6.7m tonnes every year. This staggering statistic has been released by Government waste body WRAP, which plans to publish a detailed report of its findings at the end of the month. According to the edited highlights, only half of this food waste would be edible, while the rest comprises of things like bones, vegetable peelings and tea bags. Nevertheless, this means that for every pound being spent on food around 16p is being wasted. Your Web Master says: Food waste is an excellent feedstock for anaerobic digestion. OK. Do all you can to minimise food waste, but encourage government to help fund anaerobic digestion plants and this waste food will be used for energy production. CIVIL ENGINEERS must take personal responsibility for tackling climate change, ICE president Quentin Lieper said last week. Speaking to 400 members at the annual ICE West Midlands dinner in Birmingham, Lieper challenged them to reduce energy consumption in their own offices as well as on projects and to cut travel. Lieper urged every one of the Institution's members to perform a single action every day to improve the performance of the built environment in general and their own immediate environment in particular. "Climate change is the biggest global issue we are facing," Lieper said. "The government wants to cut carbon emissions by 60% by 2050. But they can't do it by themselves. "As engineers we have a part to play not only in design, but also in our own business operations." He called on engineers to make the effort to understand why it is important to promote sustainability, to enthuse their teams, provide simple guidance, show leadership, and demonstrate and celebrate successes in achieving sustainability. BlogMaster: And: He could have said "promote sustainable technologies like Anaerobic Digestion"!? We have been asked on a few occasions recently whether Septic Tanks are anaerobic digestors. I would say, yes they are, but they are not usually thought of as anaerobic digestors. Septic tanks have a primary role, which is to treat the sewage discharged into them, and any methane produced has normally been ignored in the past in the developed nations. This is not the case in admittedly warmer developing countries where real success has been achieved in the use of anaerobic digestion of domestic and village sewage, where the aim IS to create the methane as a valuable cooking fuel for use within the dwellings served, and to use the product for its fertilising capabilities. Should we in the west be ignoring the methane outputs from septic tanks? Do they actually contribute to global warming and by how much? Feedback on this would be even more welcome than usual. Visit the article Septic Tanks: Are they Anaerobic Digestors?